We heard from Hitz.fm the other day saying that there will be free Egg McMuffin burgers given out for free from McDonald from 7am - 10am on Monday, 19th November 2012, that's tomorrow. Clet said he heard that too..why not we try to check it out tomorrow morning. I expect it to be jam packed with people. He said not necessary the case because this campaign might not applicable to Sabah, just like the one advertised in the media by Burger King on its Hottest Deals Value Burgers at RM5.95. After seeing the advertisement on TV, we happily drove to Burger King and wanted to try on RM5.95 valued burgers for our dinners one evening. The counter staff gave us a blanked look on their faces when we ordered these meals. We were then informed by their staff that this promotion is not offered to Sabah outlets. What a disappointment!! 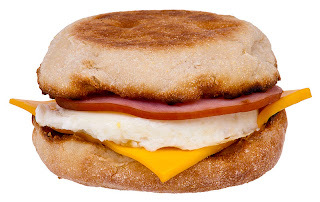 Only 1 free Egg McMuffin per customer. Free Egg McMuffin limited to the first 1000 customer per restaurant from 7am – 10am, whichever comes first. * Redemption hours of free Egg McMuffin vary by restaurant. This McDonald FREE Egg McMufin Burger promotion is on 19th November 2012, starting * 7 am to 10 am, valid for 1000 customers per outlet only. Wah, that's so nice! Have fun! Dearest Agnes, you have guessed it correct in my blog giveaway, indeed versatile blogger award is my favourite post cos in there I shared about facts about myself and readers get to know me better, bingo! you are so brilliant, kindly leave your mailing address at my email lilian_fu2002@yahoo.com and I will send the secret souvenir to you. that morning I was there to pump petrol (the McD in a petrol station) and you know what.. the queue was really a long one..